Have you ever heard of a goldenberry? I hadn't until recently, when I purchased up a bag of organic, vegan goldenberries made by Golden Power from Whole Foods. On my way home, I was glancing over my receipt and noticed the bag of them was more than $9! They certainly are not the cheapest berry I've ever purchased. I was both annoyed and intrigued. So, what are these special berries exactly? Well, goldenberries are apparently a "superfruit" that hail from South America. From what I've read they appear to be very healthy - with a high vitamin A content. They are rich in bioflavonoids, which help reduce inflammation in the body. They also contain a high level of vitamin A, vitamin C, beta-carotene, vitamin P, as well as some iron. In case you are wondering, vitamin P (sometimes known as rutin) is believed to strengthen the circulatory system in addition to helping with vitamin C absorption. What are they like? 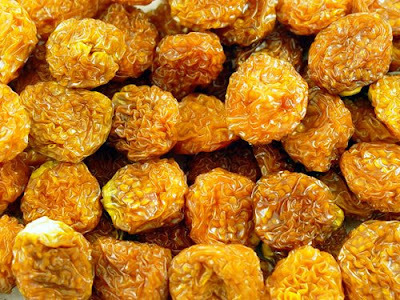 Well, these particular golden berries from Golden Power are a lot like giant raisins, but better! They have a very potent smell, and their taste is both sweet and tart (it has the essence of orange and a bit of grapefruit). The taste was a bit surprising at first (it is strong), but after a while I found that they tasted more and more like candy. In terms of calories, a serving of 28 grams has 80 calories, 0 grams of fat, 2 grams of protein (impressive for a fruit! ), and 3 grams of fiber -- so only 1 weight watchers point! There are tons of ways to eat goldenberries. You can eat them on their own, add them to low calorie oatmeal or low calorie cereal, combine them into fage yogurt, eat them with low calorie ice cream or low calorie frozen yogurt, combine them in a low calorie trail mix, or even sprinkle them on pancakes or make jam out of them. thanks for sharing your new discovery! and thanks for adding where to buy. I'll check out in whole food this weekend. I have never heard of these, but their superfood qualities and taste description reminded me of goji berries! $9!!! i would've been so upset. haha. at least they are healthy. i'm going to whole foods this sunday and i always look at new dried fruits and such. last week, i bought dried raspberries there and dried strawberries at trader joe's. i'm now an acclaimed dried strawberry addict! Hmm I wonder if they're like the other superfood from South America - acaci! Wow, I have never heard of them before! So, thanks for sharing! I am definitely going to try to find them next time I am at the store! Cheers! I just discovered your site. I love it! I am always looking for new ideas and products to help me on my weight loss journey.